Description: Level: Chemical and pharmaceutical process control system designers, engineers and managers, automation and control engineers, GAMP (Good Automated Manufacturing Practice) engineers, GAMP automation system designers and validators, industrial engineers, software / IT developers, plant managers, operations managers, and others, interested in safety integrated process automation control systems. Also ideal for undergraduate / graduate education and research. Contents: In the past, in chemical process automation systems the Basic Process Control System (BPCS) and the Safety Shutdown System (SIS) were completely independent. They were interfaced through a gateway. BPCS and SIS had their own engineering tools. This solution is still available today. Because of the cost for the separate engineering, operation and maintenance tools, and separate communication of the interfaced solution, many companies started looking for integrated solutions. These solutions have different controllers for BPCS and SIS, but they have one engineering and operation and maintenance tool. The next obvious step is the common safety integrated process automation system, with a single controller for BPCS and SIS and a single tool for engineering, operation and maintenance. 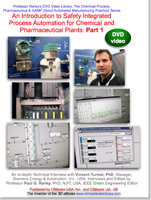 The solution introduced in this two part video series, is a safety integrated process automation control system, that enables an engineering manager to choose the appropriate level of integration for a chemical plant. As the system reliability modeling has shown, the demonstrated flexible, and modular redundancy (Siemens Flexible Modular Redundancy) delivers higher levels of availability than traditional dual and triple redundant architectures. At the same time, the flexibility of the architecture allows redundancy only where it is needed, providing a more attractive and cost-effective solution than traditional one-size-fits-all architectures. System Requirements: DVD-ROM: NTSC standard definition (SD) DVD video player for TV, or computer. Approximate length Part 1=16 mins, Part 2= 34 mins, in 16:9 widescreen format, also playable on a 4:3 regular screen, or any good computer screen (800 x 600 resolution, or better). Furthermore available in PAL DVD video, in streamed digital, and Apple Video iPod formats for mobile devices. The HD (high-definition NTSC and PAL) formats are also available. Please visit on the web www.cimwareukandusa.com for available formats, and further relating titles & products. Note, that this program continues in Part 2. Sample video clips in iPod res. : Clip-1, and Clip-2.